The Arctic sea ice cover is vast in areal extent covering millions of square kilometers. But it is just a thin veneer of ice only a few meters thick. This makes it a key indicator of climate change. If the climate is warming there should be a decrease in the amount of ice. This principle is demonstrated by the season change in sea ice extent. The extent of the sea ice cover is effectively monitored from satellite platforms using passive microwave imagery. 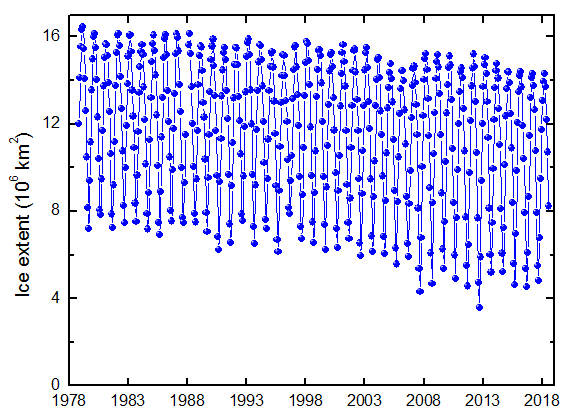 Figure 1 shows monthly values of ice extent from 1978 to 2018.The largest signal is the seasonal cycle. Peak values typically occur in March and the minimum ice extent in September. The March – September seasonal variation is a little more than a factor of two. To examine climate change impacts we focus on the September ice extent. September is when the ice extent reaches its annual minimum and any climate change would be most evident (Figure 2). While there is considerable year to year variability, the observations show a significant downward trend in September sea ice extent. Fitting the data with a simple linear least squares equation gives an average decrease of 13 percent per decade. Figure 2. September ice extent. The solid blue line is the linear least squares fit to the data. The red circles denote the two comparison years 1980 and 2012. There was a major September ice extent event in 2007. At the time, the 2007 summer sea ice extent marked a new record minimum of passive microwave satellite observation period. 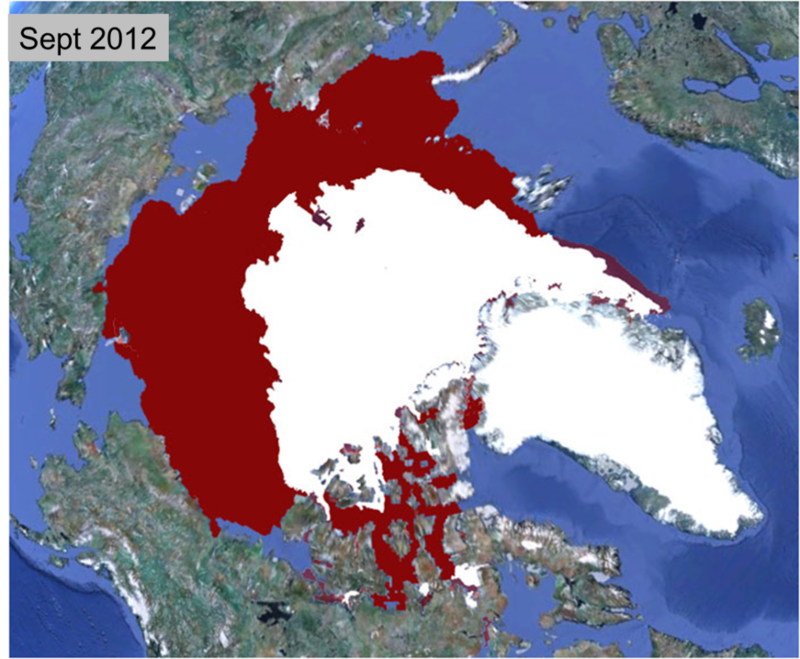 At 4.3 million km2 the 2007 summer sea ice cover was 39 percent smaller than the long-term average from 1979 to 2000. 2007 also had the largest year to year drop in the record. The 2007 minimum record was broken in 2012 when the September ice extent dropped to 3.4 million km2. While there has been interannual variability, the September extent has never returned to pre-2007 levels. The changes in the spatial distribution of ice are illustrated by comparing the September ice extent in 1980, when values were large, to 2012, which is the record minimum (Figure 3). 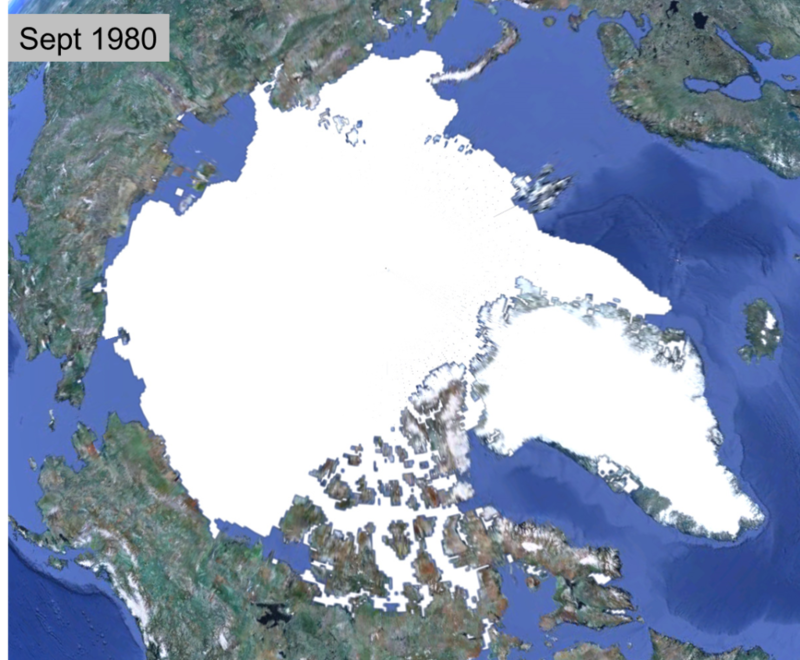 The September 1980 ice extent was 7.8 million km2 and sea ice basically filled up the entire Arctic Basin. By 2012, there were large losses off the coasts of Alaska and Siberia and the ice extent had decrease to 3.4 million km2 for a loss of 4.4 million km2. Figure 3. Ice extent in September 1980 and 2012. The ice loss is denoted by the red region. These are large numbers and it is hard to conceptualize the amount of ice loss. We can provide context as the 1980 ice extent was roughly comparable to the size of the continental United States. 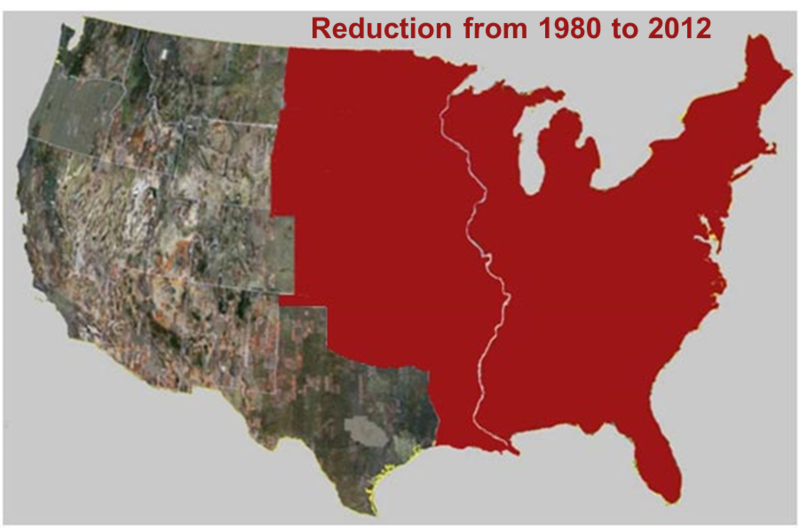 Figure 4 illustrates how much of the United States would have “melted” by 2012. It is as though the entire United States east of the Mississippi plus the column of states from Minnesota to Louisiana plus North Dakota, South Dakota, Nebraska, Kansas, and Oklahoma all melted. 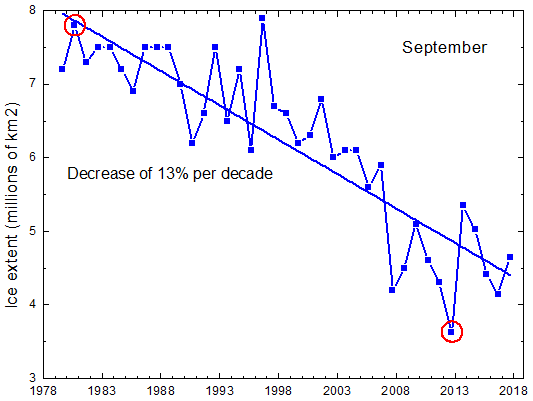 The September ice loss from 1980 to 2012 is significant. Ice mass balance measurements can help us understand how it is happening. Figure 4. Illustration of ice loss in the context of the continental United States.